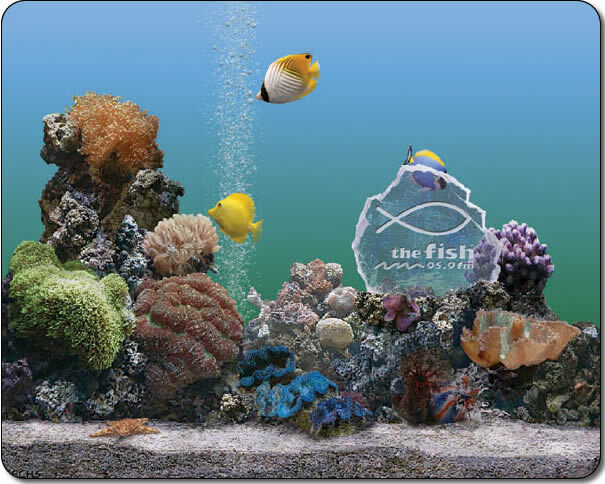 Use the SereneScreen Crystal Aquarium - PC - TheFish as a screen saver or as a stand-alone program. This special Crystal version of the Marine Aquarium features a beautiful crystal placed inside the tank. This new permanent addition is engraved with the logo of 95.5 FM - TheFish Radio station. Of course, this Crystal version of Marine Aquarium includes 21 different species of fish to choose from. Other features include a starfish, variable lighting, wire frame mode, and more! If you are interested in your own custom version of Marine Aquarium Crystal, please email crystal.sales@serenescreen.com. The 3D fish bend, turn, and swim just like real fish!